A two winding transformer is a motionless mechanism which consists of two or more immobile electric circuits interlinked by ordinary magnetic circuits for the function of transferring electrical power between them. The relocate of energy from one electrical framework to another takes position without an alteration in frequency. Single and three phase transformer works in two modes step and step down, in step up secondary voltage is greater than primary voltage and in step down primary voltage is greater than secondary voltage. The same transformer can be used as a step up transformer or a step down transformer depending on the way it is connected in the circuits. When the transformer is used as a step up transformer, the low voltage winding is the primary and in the step down transformer high voltage winding is primary [1,2]. The intention of this article is to present a widespread evaluation of various aspect of transformer. Equivalent framework of transformer is crucial to be calculated because the two winding transformer is a part of electrical power system equipment for estimate different assessment parameters of electrical power system which may be obligatory to compute total inner impedance of an power transformer, viewing from supply side or load side as per requirements. Losses measurement and testing of single and three phase transformer is used for effective efficiency calculation of static device and also find out the essential performance parameter of transformer [3,4]. Optimization technique is used to optimize maximizing function of efficiency calculation and minimization function of losses and cost calculation. This paper discusses equivalent circuit design, losses measurement, testing of device, harmonic measurement issues. The relevance of evolutionary technique and renewable energy in transformer is also accessible in this paper. Figure 1 shows categories different types of transformer. Figure 1: Types of transformer. The equivalent circuit of any device can be quite helpful in predetermination of the behavior of the device under various conditions of operation and it can be drawn if the equations describing its behavior are known. The equivalent circuit for electromagnetic devices consists of a combination of resistances, inductances, capacitances, voltage etc. Romes et al. described equivalent circuit model of 3 phases 3 legged transformer which is influenced by tertiary stabilizing winding on zero sequence performance. In three winding transformer primary and tertiary winding has the highest and lowest voltage rating respectively and the secondary has intermediate voltage rating. On the conceptual condition complete set of zero-sequence calculation taken in 3 phase transformers is analyzed in relation to internal and external design structure such as permanent winding position related to high and low-voltage windings on the presence of magnetic shunts in the conservator tank. Based on various calculations, paper analyzed the ability of different transformer equivalent circuit models to reconstruct zero-sequence performance accurately. Romes et al. explained performance of conservator tank overheating hazards and short circuit duty of 3 phase transformer. This paper assess the influence of stabilize windings in 3 phase 3-legged transformers on oil tank overheating vulnerability and on the full load test performance of such transformers in the concept of unbalanced conditions which involving zero-sequence currents as asymmetrical faults. Xiaoxiao et al. elaborated piezoelectric equivalent circuit model of transformer addition of iron and copper losses and full load external loads. In categorize to confirm the viability of the new circuit, four different external loads configurations which reflect intensive and extensive loss behaviors are explored and simulated. The series and parallel resonance and anti-resonance frequencies or time interval and their corresponding mechanical quality factors derived from the circuits are compared with the actual samples with the different resistive and inductive loads and boundary conditions. Figure 2 shows general equivalent circuit of transformer. Figure 2: Equivalent circuit of transformer. Krupa et al. explained compact circuit model of two winding transformer for examine perfunctory buckle of magnetic circuit. To reveal competence of the method 2 winding model single phase transformer is measured and deformations are introduce in its outer side winding. In this paper the position of the error is assessed by the changed different technical stricture in the transformer circuit. Juan et al. described control of voltage and phase angle of transformer by equivalent circuit model. This paper presents a tactic aimed at obtaining the exact equivalent circuit of regulating single and three phase transformers. The resulting equivalent circuit is ample for transient and steady-state calculations under balanced supply conditions and neglect transformer iron core parameters. Enrique et al. presented frequency dependencies of the transformer impedance by novel linear equivalent circuit model. An innovative perception for the portrayal of a transformer winding or a positive feature of magnetically united coils by means of an equivalent circuit framework which is presented in this article. This linear circuit is apposite for the illustration of the frequency and time performance of a system of supply side and load side winding coils at very high frequencies and it consists of resistive inductive coupled circuit elements. The frequency and time behavior representation of the actual impedances is consummate by means of other resistive inductive loops. Yongkun et al. elaborated performance of multilayer piezoelectric stack by 3 port equivalent circuit model of transformer. Multi-layer piezoelectric transducers (MPS) is a non-electrical to electrical conversion device stacked by plentiful thin piezo layers, which can worked as an actuating device, sensor, energy harvester and as a single phase transformer. This article point out the boundaries of precise equivalent circuit for the effectual modeling of MPS and proposes a 3-docks comparable circuit of MPS which is enthused by the inspiration of circuit theory and formulate precisely on the basis of the simplified rudiments. Alberto et al. explain effect of a lossy dispersive ground on lightning overvoltage transformer. This paper presents a study of lightning over voltages transfer to the low-voltage side of a single-phase distribution transformer based on dispersive ground effects in the medium-voltage distribution line terminated at its primary side. A two-port wideband model of transformer that is capable to represent the static device behavior under resistive, inductive and capacitive load conditions is considered. The medium-voltage distribution line is modeled using Marti’s transmission line model modified to include the variation with frequency of the ground resistivity and permittivity. Figure 3 shows type of equivalent circuit model. Figure 3: Types of equivalent circuit model. Juan et al. assessed importance of transformer bank in electrical energy system. This paper is based on comparative study of capital cost of three phase transformer distribution bank. Total mass and total capital cost is main criteria of this comparative study and result show that three phase transformer bank should be recommended in case small size transformer. Yann et al. developed an equivalent circuit model of transformer for iron loss measurement in terms of eddy current nondestructive performance. The framework of a sensible arrangement of nondestructive estimate by eddy currents usually requires absolute analytical developments. In this representation the eddy current sensor constitute the supply side of the transformer whereas the evaluated non-insulated plate forms the transformer secondary electrical demand. Table 1 shows summary of equivalent circuit of transformer. Table 1. shows summary of equivalent circuit of transformer. Boukazouha et al. explain comparative analysis of equivalent circuit model and mathematical verification of piezoelectric transformer. In this paper, a review contrasting a model of a composite piezoelectric transformer, in view of the relating electrical proportionate circuit, and the immediate figuring settling the mechanical principal conditions compelled by the suitable limit conditions is introduced. The approach is streamlined considering vibrations just along one course, disregarding the coupling marvels existing along alternate headings. The electrical comparable circuit of the transformer is acquired from the proportionate circuit alluded for the disconnected piezoelectric oscillators. In this paper, each electrical proportionate circuit is put in on a course in request to preserve the coherence of relocations and worry at the intersection. Milano et al. described dynamic equivalent circuit model for short circuit, transient and steady state model of single phase and three phase transformer. This paper proposes a deliberate approach for dynamic power framework reciprocals in light of energy exchange circulation components. The proposed technique isolates the first system into an inward interconnected framework and an outer one. Static counterparts are processed at wilderness transports that different held interior framework from the outer one. The reciprocals are shaped utilizing REI (Radial, Equivalent and Independent) systems and generator display conglomeration. Generator parameters are figured in light of energy exchange dissemination elements of the produced dynamic power. Cui et al. assessed transformer insulation diagnosis by pattern recognition techniques. In this article discussed detailed literature review on various pattern recognition technique and application and significance of this technique in transformer insulation diagnosis. Hemsel et al. analyzed exact equivalent circuit model of piezoelectric transformer. The intention of this learning was to examine a single and three phase iron core transformer framework that has the probable of as long as higher electric field intensity and density and wider range of current, voltage and power gain. This framework was establish to make available 30 W powers with maximum efficiency and 30°C temperature increase from the room temperature. The equivalent model was found to successfully predict the characteristics of the transformer and result shows excellent matching between the computed and experimental results. Oliver et al. described analytical and arithmetical equivalent circuit framework of a T associated three phase transformer and used to estimate the belongings of the impedance unbalance in supply side and load side winding. This model based on single-phase copper loss measurement tests that can be used to conclude voltage unbalance, active and reactive transformer losses, short-circuit impedances and other transformer parameter. Rao et al. evaluate most favorable and computational proposition of furnace transformer by evolutionary and optimization technique and in this article three artificial evolutionary optimization techniques is used to examine the most favorable intend parameter of a 3-phase furnace transformer. Scatter Search (SS), Particle Swarm Optimization (PSO) and Genetic Algorithm (GA) techniques are used to developed nonlinear arithmetical framework of the transformer for cost minimization function. Marina et al. portrayed PC helped investigation and a proportionate circuit plan of energy transformer and in this paper a coordinated, three-dimensional, limited component bundle for the examination and outline of energy transformers is created. The bundle comprises of a computerized pre-processor, magneto static solver and post-processor and keeps up high exactness, low computational cost, minimization of client cooperation and practical interface are the primary points of interest of the product. Okelly et al. assessed identical circuit parameter of energy recurrence transformer. The exact equal circuit for a solitary stage control recurrence transformer might be characterized with various parameter values subordinate upon a chose turn's proportion which is near the ostensible proportion. A technique for estimation of the individual winding spillage impedance is depicted and comes about for two transformers with generally unique coupling coefficients approve the hypothesis that the parameter values shift relatively to the adjustment in the chose turn's proportion. Above discussion show that technical behavior of transformer is very complicated so that it will design on the basis of linear, thermal, magnetic circuit of transformer to understand the performance of different parameter of this type of static device. Thermal modeling of two winding transformer is essential to ensure the most favorable design and cost of manufacture of transformer. Either of the experiential formulae available from the standards and practical measurement techniques which is used in the industries as an option to the formulae will not be able to respond the quandary exactly and hence the development of software and microprocessor based thermal modeling techniques that use the compensation of today’s computational power and create a quicker as well as best solution is the need of the day. It is necessary to develop an equivalent circuit for the transformer winding in which the iron losses in the transformer can be represented accurately at very high frequencies and also expand effective method for the determination of equivalent circuit model. Losses measurement of the transformer is the effective way to calculation of efficiency of transformer. There are iron, copper, stray load and dielectric losses occur in transformer. Iron and copper losses are constant and variable losses which are measured by open circuit and short circuit test respectively. Hysteresis and eddy current losses which are the part of the iron or core losses depend upon the maximum flux density in the core and supply frequency. Xingmou et al. presented losses characteristics at laminated core joints in a single phase transformer. The laminated joint replica is planned to solve the iron core losses and hot-spot temperature rise problems of a transformer iron core, which are mainly caused by the nonstandard magnetic field of joints in the laminated iron core. The different structures and sizes of the joints are considered when designing the proposed model and an equivalent method of joint building factor (JBF) is presented to compute and clearly reflect the relation between core losses and the design structures. Jayanth et al. described iron and core losses measurement and calculation of magnetic curve due to development of voltage harmonics. This paper investigates the voltage distortion phenomenon during no-load testing of transformers and its influence on open circuit loss calculations and a measurement technique that is unchanged by harmonics for obtaining single phase transformer magnetization B-H curves. Owing to economic reasons, open circuit loss correction for indistinct test signal has been addressed to some extent in accessible standards, while not much has been done on the aspect of calculation of magnetization distinctiveness. This is important for parameter estimation and transformer modeling in power system transient simulations. Results from two test cases are presented, one is based on factory testing with 290-MVA, three-phase, three-legged power transformer and second is a more comprehensive analysis using a laboratory test setup with a 22-kVA single-phase transformer. Figure 4 shows classification of losses of transformer. Figure 4: Classification of losses of transformer. Picanco et al. elaborated losses measurement of distribution transformer by polynomial interpolation approach. This article aims to approximation the preliminary stress voltage allocation in the transformer core windings through their iron losses through the arithmetical utterance functional in capacitive reactance of distribution transformers of unusual rating. María et al. explained losses calculation at transformer foil winding. Proposed method based on 2D finite constituent models for accelerating the computation of supplementary losses in bulky foil windings of dry-type distribution transformers and compare with a detailed 2D recreation of the windings. Pronto et al. described possible solution of magnetic losses measurement of transformer core which is worked at liquid nitrogen temperature. This effort try to assess the magnetic iron and core losses escalating at 77 K for dissimilar magnetic materials and the opportunity of reducing core losses under some specific treatment of magnetic materials. For this reason numerous low temperature dimensions are presented to distinguish the magnetic performance of four electrical steels frequently used in transformer cores. The chosen magnetic materials are three crystalline materials, two grain-oriented and one non oriented steel and amorphous electrical steel. Janu et al. displayed precise misfortune estimation for proficiency estimation of high temperature super directing transformer. A basic cryogenic framework for testing of the superconducting power transformer was built and warm protecting security is given by extra fluid nitrogen shower rather than super-protection. The entire circuit together with utilization of an exact nitrogen fluid level meter allowed calorimetric estimations of misfortunes of the 8 kVA HTS transformer with a determination of the request of 0.1 W. Susnjic et al. portrayed 3D limited component assurance of stray load misfortunes in influence transformer. In this paper a three-dimensional (3D) limited component (FE) technique is utilized to figure a swirl current misfortune which is created in the tank dividers and burden cinches of a three-stage 40 MVA influence transformer encourage the time symphonious FE model is utilized to register the attractive spillage field on account of a short out state of the influence transformer. Lingguo et al. clarified strategy for estimation of transformer symphonious misfortunes. In the article consonant comparable parameter demonstrates has been utilized to decide the recurrence subordinate qualities of symphonious winding model and the identical non-direct superposition considered. Georgilakis et al. exhibited press misfortune estimation of transformer by manufactured neural system. This paper exhibits a manufactured neural system (ANN) way to deal with anticipating and grouping conveyance transformer particular iron misfortunes with misfortunes per weight unit. The ANN learning and testing sets are framed utilizing real modern estimations gotten from other finished transformer developments. Raitsios et al. assessed lessening and controlling strategy for misfortunes of dissemination transformer. The reason for this work is to decide the ideal diminishment of iron and copper misfortunes in conveyance transformers. Plan and life-cost counts for transformers 20 kV/400 V of an ostensible power 50–1000 kVA were performed, for assessing the last transformer cost for various measures of misfortune decrease and with a specific end goal to discover the base yearly operational cost of these transformers. Zhang et al. depicted online estimation of dielectric misfortune variable of gadgets transformer. The paper proposed a high-precision advanced calculation for online estimation of dielectric misfortune component of electronic transformers and on hypothetical premise the new calculation which depends on information preparing including information truncation and information expansion which remunerates stage bending subsequently of the range of expansion information contains balances of electronic transformer. Asrami et al. dissected no-heap misfortunes estimation of dissemination transformer by limited component examination. In this paper, Finite Element Method (FEM) has been utilized to recreate non-sinusoidal voltage consequences for no-heap loss of transformers and such kind of examine the diverse electromagnetic parameters, for example, flux lines, flux thickness, misfortunes, and so on under various information sources and with high exactness. Illias et al. assessed transformer blame determination by molecule swarm improvement and simulated neural system. In power transformer blame determination, broke up gas examination (DGA) has been generally used to recognize the sort of the blame. The exactness of the DGA finding will decide the cost, term and workload of the upkeep since it can impact the blunder in the support. Kucuk et al. broke down power misfortunes of dissemination transformer by neural system and hereditary calculation. A scientific model for center misfortunes was enhanced for recurrence and geometrical impacts utilizing exploratory information gotten from toroidal injury centers and the enhanced numerical model was connected with the other delicate attractive materials and streamlines its parameters with the assistance of neural systems. Arri et al. portrayed vulnerability investigation of misfortunes estimation of conveyance transformer. The vulnerabilities acquired with a novel technique for measuring power misfortunes in transformers are analyzed. These vulnerabilities are contrasted and those acquired by measuring power misfortunes as the distinction between information influences ingested and yield influence conveyed and it gives the idea that the new technique offers certain preferences with an appropriate selection of instruments. Gouda et al. introduced misfortunes estimation of transformer at the nearness of load symphonious streams. The point of this paper is to present problem area and top-oil temperature rise demonstrate over surrounding temperature model and warm model under unsurprising and eccentric burdens. For more precise temperature counts MATLAB is utilized to compute the power transformer temperature. Escarela-Perez et al. clarified 3D limited components display for exact estimation of no heap and full load misfortunes of single stage transformer. Six-port impedance organizes for a three-stage transformer is acquired from a 3D time-symphonious limited component (FE) display. The proportional circuit show legitimately catches the swirl current misfortune and all hypotheses and instruments of uninvolved direct systems can be utilized with the multi-terminal model to discover a few essential working conditions without turning any longer to computationally costly 3D FE reproductions. Cortez et al. depicted an intellectual framework for blame anticipation in power transformer. The proposed framework joins both transformative and connectionist instruments into a cross breed demonstrate that can be a fundamental apparatus in the improvement of a prescient support innovation, to expect when any hardware blame may happen and to forestall or diminish spontaneous receptive upkeep. Outcomes: Based on the above discussion end losses measurement of transformer is very essential to find out performance of transformer in terms of efficiency of transformer which show how transformer will work, if it is connected in electrical power system. In addition, development of iron loss measuring technique using infrared thermograph enabled to visualize iron loss increase near the joints of sheets of two winding transformer. Three dimensional measurement using laser micrometers helped clarify the vibration behaviors of the cores under three phase excitation. As one of the investigations of effects of excitation conditions, iron loss and acoustic noise are measured under direct current (DC) biased excitation. It is necessary to develop advanced technique to measure losses measurement in effective way with the help of different type of optimization technique. Testing of transformer is an episodic examination that will disclose if any circuits of single and three phase transformer are being burdened, locate any probable electrical shock risks and fire hazards in an setting up, recognize any imperfect electrical work, or highlight any lack of grounding or bonding. Hamed et al. described detection of two winding transformer mechanical deformation by different frequency response analysis connection. This article proposes a narrative method based on compare FRA traces of different correlation schemes recorded from the same low and high voltage winding to find out the mechanical deformations and losses in terms of stray losses. Furthermore an equivalent circuit model of the windings is created and the simulation results are also used to corroborate the experimental measurements of different parameters. Dolce et al. developed a test instrument for the compliance check of insulated winding of two winding power transformer. In this article a new testing and calibration instrument particularly planned for the observance check of windings for Medium Voltage/Low Voltage (MV/LV) cast resin insulated two winding power transformers is presented. The proposed instrument based on the sweep frequency response analysis measuring procedure has been designed to carry out automatic measurements during the industrial production of the windings. Bengang et al. studied on simulation test device of transformer split type cooling system. This paper would investigate the simulation test method of split cooling system based on a 10kV two winding distribution transformer. The test instrument can understand the adaptable control for the vertical and level position and as indicated by the temperature-rise test technique for transformers, execution trial of split sort cooling framework was yielded out in view of the change of oil stream or radiator area. At long last, the exploration aftereffects of various pipe measurement, stature and flat appropriation were proposed. Guerra et al. developed a solid state transformer model for power flow calculations. This paper exhibits the execution of a Solid State Transformer (SST) show in Open DSS. The objective is to build up a SST show that could be helpful for surveying the effect that the substitution of the ordinary iron-and-copper transformer with the SST can have on the dissemination framework execution. Test circulation frameworks of various attributes and size have been recreated amid various eras. Sahebi et al. evaluated power transformer inrush currents and internal faults discrimination methods in presence of fault current limiter. This paper manages examination of FCLs effect on power transformers' differential security. The execution of some notable differential assurance calculations for segregation between internal winding current and charging inrush current with and without nearness of FCL are assessed. Li et al. clarified secluded multilevel converter sort strong state transformer with inward model control system. Comes about demonstrate that the inner model control based MMC-SST can run stable under the required power figure, and the great exhibitions, for example, quick voltage and current reaction speed, solid against aggravate capacity to stack, and improved vigor on framework operation are illustrated. Arumugam et al. explored on terminal association and framework work combine amid SFRA testing on three stage transformers. The writer has officially tended to this issue for single stage, two-winding transformers. In any case, three stage multi-winding transformers are very extraordinary in development. Along these lines, the appropriateness of a similar setup (single stage, two-twisting) on three stage transformers stays to be determined. Additionally, there exist a few conceivable outcomes of substitute terminal association and framework work that may give more knowledge into the status of the winding-center get together. Alepuz et al. displayed testing of a bidirectional circulation electronic power transformer demonstrate. In this work, a model for a bidirectional high-recurrence control electronic transformer is exhibited. A few contextual analyses have been completed with a specific end goal to assess the conduct of the transformer under various working conditions and test the effect on the power quality. The outcomes demonstrate that the electronic power transformer, otherwise called strong state transformer, not just matches the elements of an ordinary power transformer, and additionally gives extra capacities to relieve dynamic power quality issues. Purwadi et al. portrayed testing and diagnostics of neutral earthing current on 500kv/150kv cover transport transformer in tasikmalaya EHV key substation. The examination and engendering demonstrate that on the off chance that it is in regular condition whether distorted, adjusted the aggregate resultant reasonable earthing current ought to be zero when there is no confirmation spillage to ground. Jin et al. assessed vibration transmission from interior structures to the tank of an oil-filled two winding force transformer. The results allow an evaluation of the transmission efficiency of vibration from the inside structures to the tank, and the effects of fluid–structure coupling on the transmission. This test work upgrades appreciation of vibration transmission in oil-filled power transformers, and illuminates the characteristics of a transformer's on-line vibration. Borowik et al. examined eco-proficient control of the cooling frameworks for power transformers. A proper control of the cooling framework by Programmable Logic Controllers enables one to diminish the "death toll" of the protection arrangement of the transformer. Extra indicative capacities gone for enhanced resource administration may likewise be effectively actualized. Down to earth cases of eco-accommodating arrangements actualized at PPH Energo-Silesia Ltd. are introduced and examined in detail. Zhou et al. portrayed two winding transformer winding deficiency identification by vibration investigation strategies. In this paper, the vibration of compel transformer windings is considered with the purpose of perceiving the winding fundamental condition. A winding vibration show consolidated with electromagnetic oblige examination is proposed to procure the reliable state vibration scattering along the center heading. In the midst of the test, the model was endorsed on a full size, 50 MVA, three phase control transformer. 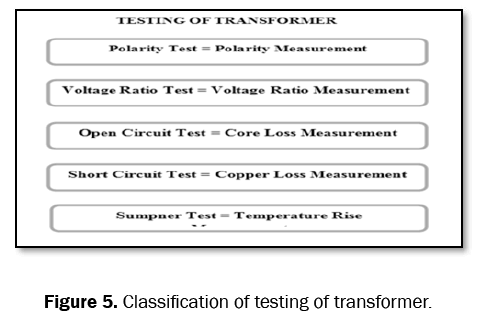 Figure 5 shows classification of testing of transformer. Figure 5: Classification of testing of transformer. Rostaminia et al. experienced transformer core involvement to fractional discharge electromagnetic waves proliferation. In this article, the two winding transformer center consequences for PD EM wave engendering are examined. To deal with this agonize, distinctive center outlines are reproduced. Limited Integration Time (LIT) technique is utilized for electric field inference through utilization of Microsoft CST microwave studio Software. The tests record electric fields are broke down utilizing wavelet change. Yang et al. presented based on reduced-scale model with dimension and investigation of transient overvoltage allocation in transformer windings. Inquire about on the estimation of motivation voltage circulation is vital and handy in designing. As per the association between corporeal amounts, the present review set up a streamlined shrinkage proportion paradigm. At that point, the specialists composed a comparable proportion 1/20, wrote 10 kVA 220 V/2400 V, tapped transformer diminished scale display, and utilized the limited component reenactment programming to recreate the lessened scale and the first model of the electromagnetic field. At long last, a test stage was worked to quantify nanosecond beat voltage and lightning motivation voltage appropriation in transformer winding. Abdoos et al. described precise scheme for detection of current transformer saturation based on time frequency analysis. Jung et al. presented as radicalism purposes of the proposed list are resolved for recognition of immersion areas, the proposed technique is not influenced by CT parameters. They got comes about demonstrate that the proposed calculation can decisively identify CT immersion time interims even in boisterous condition. Sahebi et al. evaluated power transformer inrush currents and internal faults discrimination methods in presence of fault current limiter. This paper manages examination of FCLs effect on power transformers' differential security. The execution of some outstanding differential insurance calculations for segregation between inner winding current and polarizing inrush current with and without nearness of FLC are assessed. Outcomes: For confirm the stipulation and performance of an electrical two winding transformer it has to go through statistics of testing measures. Some tests are done at company premises before deliver the transformer. Above discussion shows that testing is very necessary step before the installation of transformer at site area. It is necessary to develop high level integrated testing equipment which is used to test all type of internal and external fault of transformer. For advancement of testing procedure enhance software based testing technique which is used to find out different type of fault efficiently and chances of error is negligible. Reliability is characterized as the likelihood of a gadget or framework playing out its motivation sufficiently for the expected working timeframe. It is likewise characterized as the capacity of electrical power framework to supply the framework stack having solid congruity and nature of supply. Figure 6 shows indices of reliability analysis. Figure 6: Indices of reliability analysis. Khanaji et al. described reliability analysis of transformer internal faults using sweep frequency response analysis. The analysis of three different equivalent model transformers with different low and high voltage winding designs shows several trends in frequency and time response patterns which is depending on the location of the internal short circuits conditions. The paper discusses such trends as a potential use of SFRA in locating inter-turn winding failures that may result in noticeable short circuits condition which is harmful for the working of transformer. Hamzeh et al. assessed dependability investigation of conveyance transformers with high entrance of dispersed era. In this paper a story strategy is displayed to ascertain the small scale lattices unwavering quality with respect to the dynamic warm maturing breakdown of transformers. The broad nearness of conveyed era (DG) units decreases the stacking temporary through the dispersion transformers and therefore enhances the dynamic warm disappointments of given framework. The framework dependability is examined for different entrances of various situations from the perspective of DG advances. Ma et al. explained load transformer capability of two winding power transformer. This article assessed load to be transferred according to percentage of the capacity load ratio of each load transformer. Guerra et al. described reliability assessment of a solid state transformer model for power flow calculations. The general approach created offers a practical hazard need screening model for transformers, which can be connected before thorough testing and examination systems on individual things amid the RCM applications. This paper surveys the writing and afterward applies control transformer contextual analyses to build up a hazard appraisal display that expands the probabilistic capacities of Reliability-centered measurement (RCM). It is normally exceptionally hard to survey the adequacy of the RCM at its commencement, when information is insufficient or when it is actualized on a vast populace of benefits, particularly when a large portion of them are little in size as in the dispersion frameworks. Kaczmarek  developed voltage to single-ended voltage converter to determine the composite error of voltage transformers and dividers for transformation of sinusoidal and distorted voltages. A goal of the paper is to present a method and measuring system that enables determination of the composite error of voltage transformers and dividers for transformation of sinusoidal and distorted voltages. Moreover, the cost-effective procedure for evaluation of transformation accuracy of the designed wideband, high impedance and symmetrical differential voltage to single-ended voltage converter is presented. Hajipour et al. described probability assessment of distribution transformer sizing in a harmonic involved load environment via dynamic programming technique. The general approach created offers a practical hazard need screening model for transformers, which can be connected preceding thorough testing and review systems on individual things amid the RCM applications. This paper surveys the writing and afterward applies control transformer contextual analyses to build up a hazard appraisal show that expands the probabilistic capacities of Reliability-focused upkeep (RCM). It is normally exceptionally hard to evaluate the viability of the RCM at its initiation, when information is insufficient or when it is executed on an expansive populace of benefits, particularly when the majority of them are little in size as in the conveyance frameworks. Zhang et al. investigated factual examination of inrush streams in power transformers in view of higher-request insights. This article introduces an account technique in light of higher-request insights for segregation between charging inrush and inward blame in power transformers. The dissemination uniqueness of the example purposes of differential streams under different working conditions are right off the bat researches and evaluates utilizing higher-arrange data. In light of these qualities three kurtosis-based lists are characterized for recognizing inrush current from inside blame current. Ahmad et al. exhibited impede investigation utilizing FEM in power transformer on HV winding dislodged vertically and on a level plane. This article figured the powers and stresses set up in transformer windings as the aftereffect of outside or inside short-circuits or of exchanging operations of the given framework. An assortment of courses of action of windings in huge power transformers is depicted. Suwansari et al. analyzed asset management of power transformer by risk based maintenance. It includes taking information yield information from transformers over a one year time span and creating exchange elements of the bimonthly change forms for the given time frame. Sefidgaran et al. created unwavering quality model of the power transformer with oil characteristic air constrained cooling. This paper extricates a total dependability show for a transformer with ONAF cooling framework, which is the most widely recognized kind of energy transformers. The transformer is first grouped into three distinct sorts of subsystems and an unwaver ing quality model is there after created comparing to every subsystem. Markov expository process and recurrence and time term methodologies are utilized to break down the identical models and accomplish their adjusted portrayals. Hong et al. explained a vibration measurement system for health monitoring of power transformers. In this paper discussed four complementary diagnostic techniques for two winding power transformers based on sensations that provide health metrics from different perspectives. Based on practical analysis the vibrations of several in-service single phase transformers under different circumstances are collected and the subsequent diagnostic results are obtained. Zhang et al. analyzed determining of broke up gasses in oil-drenched transformers in light of wavelet LS-SVM relapse and PSO with transformation. An approach consolidating wavelet strategy with minimum square bolster vector machine (LS-SVM) for guaging of broke up gasses in oil-submerged two winding transformers was expected in the article. The calculation of molecule swarm enhancement (PSO) with transformation is utilized to improve the hyper-parameters of built wavelet LS-SVM relapse. The appraisal of determining execution depends on the measures of squared relationship coefficient and mean outright rate blunder. Murugan et al. portrayed disappointment evaluation of high appraising force transformer for successful support arranging in electric utilities. This review gives a hypothetical and functional supervision to help operation and upkeep faculty for the best misuse of the power transformer in electric utilities. Abdelfatah et al. dissected dependability examination of 220 kV control transformers in Egypt. In this article, blackout information examination of 220 kV two winding force transformers is considered and information are gotten and investigated from the Egyptian Electricity Transmission Company. Blackout information investigation more than 8 years from 2002 to 2009 of 252 transformers with MVA rating running from 40 MVA to 150 MVA is watched facilitate a few execution lists are resolved for assessing the unwavering quality of energy transformers. Godina et al. introduced inventive effect appraisal of electric vehicles charging loads on two winding circulation transformers utilizing genuine information as far as unwavering quality and likelihood evaluation. This paper surveys the crash of EV charging load on the dielectric oil disintegration of two genuine Power Distribution Transformers (PDTs), which is associated from private and mechanical load situated in the separate matrix of Sao Miguel. Genuine information are utilized for the principle contributions of the equal model which comprise count of the day by day private load bend, the day by day private modern customer stack bend, the PDT parameters, time-of-utilization rates and EV parameters. Lukas et al. grew new unwavering quality coefficients of medium voltage (MV) and low voltage (LV) transformer/circulation substation and its segments. This paper presents the possibility of utilization of u-and k-coefficient to operational unwavering quality investigation of MV/LV transformer/dispersion substations encourage the disappointment span list was appeared to have particular imperatives in financial related appraisal of electric vitality framework dependability examination. Madavan et al. dissected disappointment examination of center sort transformer fluid strong protection framework under specific ecological conditions utilizing Weibull insights technique. This work means to look at the glitch of transformer fluid protection (LI)–solid protection (SI) framework at different selective natural conditions on the base of relative mugginess of the air as an as often as possible variable ecological element. For appropriate protection arrangement of transformer mineral oil (MO), regular ester like sunflower oil (SFO) and rapeseed oil (RSO) are utilized for LI framework and Kraft paper is utilized for the SI framework. Jirutitijaroen et al. clarified the impact of transformer upkeep parameters on dependability and cost examination by probabilistic model. This paper creates nitty gritty models relating upkeep parameters to dependability and cost and afterward researches the impact of differing model parameters. Reproduction comes about because of the proposed model are appeared and supported by scientific examination of a less difficult proportionate model. The examination covers mean time to the principal disappointment, upkeep cost, assessment cost, and disappointment cost. Martins  depicted condition and hazard evaluation of energy transformers which is a general way to deal with figure a Health Index of two winding single stage transformer. The "Wellbeing Index" was created to survey and group transformers in light of their condition and to bolster choices, concerning remodel and substitution. The fundamental ideas related to the "Wellbeing Index" and to its estimation strategy are clarified here, in an outlined manner. Esmaeeli et al. evaluated multistage appropriation substations arranging considering dependability and development of vitality request. In this article an approach is proposed for the arranging of the LV conveyance arranges in which the dispersion transformers are ideally sorted out. The size, number, and position of the conveyance transformers are resolved so as to enhance the framework dependability execution and to limit the center and copper misfortunes under the vitality request development. Testa et al. depicted probabilistic way to deal with size stride up transformers for framework associated PV plants. Probabilistic approach is likewise called LPPP (Loss of Produced Power Probability) file which is utilized to locate the ideal transformer estimate for a matrix associated 2 MW PV plant situated in various land destinations. Han et al. clarified likelihood appraisal by transformer blame finding in light of highlight determination and parameter enhancement. The right grouping of properties of broke up gas information can advance proficiency of transformer blame conclusion. Ahmed et al. examined likelihood and dependability appraisal by resource administration procedures for two winding transformers. In a deregulated/transformed condition, the fortifying utilities are under steady weight for limiting working costs, expanding the unwavering quality of transmission and circulation types of gear, enhancing nature of energy and administrations to the client. Outcomes: The transformer reliability study will discover weaknesses within your facility’s electrical power distribution system that may lead to equipment failure. A reliability study helps to determine how your facility can optimize the relationship between the costs of adequate operations and maintenance and the cost of lost production of two winding transformer. Different types of reliability indices provide knowledge of adequate parameter of this electrical energy transformer device. Now a day’s fault tree analysis is an efficient method to determine reliability and fault calculation of transformer. In future recent technique of reliability analysis also provides current state of transformer as well as prediction of future equipment failure. Harmonics are usually defined as sinusoids of any frequency other than the fundamental frequency of AC power system. The main source of the harmonics is any non-linear loads that produce the voltage harmonics and current harmonics. This occurs because the resistance of the device is not a constant. The resistance in fact, changes during each sine wave. So, nonlinear device is one in which the current is not proportional to the applied voltage. Jayanth et al. described influence of voltage harmonics on two winding transformer iron loss measurements and calculation of B-H curves. This paper investigates the voltage distortion occurrence during open circuit test of transformers and describes a novel measurement technique that is unaltered by harmonics for obtaining transformer B-H curves. Due to economic reasons, no-load loss alteration for indistinct test waveforms has been addressed to some extent in existing standards, while not much has been done on the aspect of calculation of magnetization characteristics. Kaczmarek et al. explained a practical approach to evaluation of accuracy of inductive current transformer for transformation of distorted current with higher harmonics. In this paper the concept is discussed for evaluation of accuracy of inductive current transformer (CT) for transformation of distorted current higher harmonics. In proposed method the composite error (transformer correction factor) is determined for various operating conditions of tested CT in respect of primary currents RMS value, distortion and secondary winding load active power. In this practical approach distorted primary current generated for the tests contains multiple harmonics. Hajipour et al. described sizing of optimal distribution transformer in a harmonic involved load environment and optimized by dynamic programming technique. The harmonic currents generated in these new environments not only substantially increase the transformer load losses, but also cause abnormal winding temperature rise and hence transformer excessive loss of life. Therefore, the harmonic contents of the loads currents should be accounted in choosing the appropriate size of distribution transformers. This paper proposes a new dynamic programming (DP) framework to solve the OTS problem. Although the proposed DP method considers the transformer thermal equations, however, by introducing a novel variable named the depreciation cost, the consecutive stages of the proposed DP network are hold independent. Therefore, the proposed DP method does not require any supplementary heuristic algorithm to solve the OTS problem. Noshad et al. analyzed ultra-saturation phenomenon of three phase transformer in terms of nonlinear characteristics and saturation effect of current transformer. A calculation scheme is presented that is able to estimate the noise increase and the noise spectrum of electrical transformers under non-sinusoidal load conditions. Kaczmarek  created differential voltage to single-finished voltage converter to decide the composite mistake of voltage transformers and dividers for change of sinusoidal and bended voltages. An objective of the paper is to show a strategy and measuring framework that empowers assurance of the composite mistake of voltage transformers and dividers for change of sinusoidal and mutilated voltages. Also, the financially savvy methodology for assessment of change exactness of the composed wideband, high impedance, and symmetrical differential voltage to single-finished voltage converter is introduced. Taheri et al. dissected demonstrating and reenactment of two winding transformer stacking ability and problem area temperature under symphonious conditions. This paper displays the assurance of field circulation on the transformer segments utilizing limited component strategy (FEM) and the counts of problem area and top oil temperature under consonant conditions as indicated by two methods including dynamic warm model and IEEE control. The helpful existence of transformer is broke down and the stacking capacity of transformer under symphonious conditions is besides checked utilizing recreation in MATLAB. Erfanian et al. assessed symphonious cancelation qualities of exceptionally associated transformers. This paper researches the symphonious cancelation attributes of such transformers. The outcomes demonstrate that when two consonant creating burdens are associated with each single-stage side of the transformers, the music delivered by the heaps will offset at the essential sides of the transformers. The measure of cancelation is influenced by transformer sort and consonant request. The review is performed for seven sorts of uncommonly associated. Abdoos et al. developed an accurate scheme for detection of current transformer saturation based on time frequency analysis. In this paper, a new algorithm is presented for detection of CT saturation time interval by using the Improved S-Transform (IST). Simultaneously, IST can yield a complete visualization of signal in both time and frequency domains. An index based on instantaneous power of the CT secondary current is calculated using the IST output matrix. Then, the saturation region is estimated by determining the maximum and minimum values of the proposed index in the time domain. Comprehensive simulations are implemented using PSCAD/EMTDC software. Outcomes: With enhance in use of non-linear and linear loads, the issue of two winding transformer harmonics are more conspicuous than ever. Industrial amenities should include a two winding transformer system evaluation, including a harmonic distortion analysis, while planning facility construction or expansion of electrical supply. Generally, at any point of common coupling (PCC) of two winding transformer, the measured value of total harmonic voltage distortion should not exceed 5.5% and that of any individual harmonic voltage distortion should not exceeding 3% of the fundamental value of the line voltage. Normally, in transformer typical applications, the harmonics are measured up to 25th order, but in critical applications, those are measured up to 50th or 100th order. Power is the essential component for industrialization, urbanization, monetary development of any nation. There are distinctive sorts of traditional and Non-ordinary vitality sources used to produce power. Sun powered and wind vitality framework is a standout amongst the most unmistakable wellsprings of vitality. The usage of sun powered and wind vitality framework has turned out to be progressively famous because of measured and condition cordial nature. The field of Solar–Wind has encountered an astounding development for recent decades in its far reaching utilization of independent to utility intuitive Solar-Wind frameworks. Sarimuthu et al. depicted an audit on voltage control techniques utilizing on-load tap changer transformers for systems with sustainable power sources. In the cutting edge's on-load tap changer (OLTC) and programmed voltage control (AVC) framework are regularly utilized in directing the system voltages of general circuits however these control procedures are no longer suitable when non-traditional vitality sources are associated with the circuit in view of the chance of bidirectional power streams. This paper shows a review as far as significance and restriction of different OLTC voltage control plans which are utilized to control the voltage in various sorts of conveyance systems. Murugananthan et al. portrayed difficulties with non-regular vitality sources and capacity in useful conveyance frameworks. This article depicts the condition of workmanship in different sorts of load stream examination strategies which is utilized to dissect the execution parameters in dispersed system (DN). This paper likewise underlines the different difficulties of appropriated systems with the hybridization of sustainable power source framework facilitate the significance of Demand Side Management (DSM) and vitality stockpiling in DN are additionally investigated in this paper. Bakhsh et al. grew new doubly energized synchronous generator based wind vitality change framework which is utilized for encouraging a detached load through factor recurrence two winding transformer advance the anticipated course of action does not use any power hardware based interface as in traditional savvy network based individual wind vitality transformation frameworks. The investigation and reproduction models of proposed setup have been created under MATLAB-Simulink condition. Bakhsh et al. portrayed utilization of variable recurrence transformer (VFT) for framework associated wind vitality era framework. To approve the anticipated plan a reproduction display has been created under MATLAB condition and a progression of energy stream contemplates from the lasting magnet synchronous generator (PMSG) to the matrix utilizing VFT at various PMSG execution has been done with this model. The framework which is proposed by the creator is having practically a similar proficiency yet with unimportant aggregate symphonious twisting. The cost investigation of both frameworks has likewise been done and it is watched that the proposed framework is less expensive than regular vitality framework. Manito et al. portrayed assessment of utility two winding transformers' life expectancy with various levels of framework associated sun powered vitality frameworks entrance. This article investigates how network associated sun oriented vitality framework entrance level would influence utility two twisting transformers by changing the mechanical worry to which these systems are subjected. The examinations completed utilized run of the mill business and private load bends and considered varieties in sun oriented vitality framework entrance, load and climate information. Furthermore, a misfortune investigation was done for a normal 100 kVA transformer in each of the reproduced circumstances. Raymond et al. clarified wind ranches sustained HVDC framework control profile upgrade utilizing strong state transformer based flywheel vitality stockpiling framework. In this article a reinforcement control molding technique for wind vitality encouraged voltage source converter HVDC transmission frameworks is exhibited. An enlistment machine (IM) based flywheel vitality stockpiling frameworks (FESS) is incorporated to the HVDC framework through a strong state transformer (SST). Pinto et al. created particular lattice converter based strong state transformer for keen networks. This paper proposes a framework shaping Modular Matrix Converter Based Solid State Transformer for savvy lattices. The Modular Matrix Converter Based Solid State Transformer directs the voltage plentifulness and recurrence of the low voltage framework, empowering list and swell alleviation. Every module incorporates a three-stage Matrix Converter, associated with a three-stage High Frequency Transformer, whose optional are associated with three Single-Phase Matrix Converters. Information and yield LC channels are required to ensure about sinusoidal waveforms in the MV association and in the LV networks. Junjie et al. depicted facilitated voltage control of a decoupled three-stage on-load tap changer transformer and photovoltaic inverters for overseeing lopsided systems. This paper presents displaying and examination of the advantages of composed voltage control of a decoupled three-stage on-load tap changer (OLTC) and photovoltaic inverters in a dispersion framework, for obliging a more noteworthy number of photovoltaic generators in the network. A 24 h root-mean-square reproduction study is performed in the Dig Silent Power Factory with a 1 s time step utilizing 10 min determination utilization and creation profiles on a genuine Danish dispersion framework, and additionally the created dynamic photovoltaic era and load models. Chakraborty et al. clarified transformer-less single-stage lattice tie nearby planetary group inverter topologies for private load application with different dynamic and aloof channel circuits. Different inverter topologies are displayed, analyzed, and assessed against segments utilized, measure, cost, self-life, misfortunes, and proficiency. Outcomes: Transformer is a static gadget which exchanges electrical vitality starting with one circuit then onto the next circuit without change of the recurrence. Control transformers interfacing sustainable power source generators to the network need to cook for an arrangement of conditions not found in customary generators in view of revolving machines. Both sunlight based PV and wind utilize inverters to change over DC to AC at the matrix recurrence, which have their own particular unconventional arrangement of conduct. Since every inverter has an alternate profile, the transformer must be composed particularly for every establishment. The traditional advancement procedures are helpful in finding the ideal arrangement or unconstrained maxima or minima of nonstop and differentiable capacities. These are explanatory strategies and make utilization of differential analytics in finding the ideal arrangement. Liu et al. portrayed acoustic fractional release restriction system in power transformers by utilizing the quantum computerized reasoning hereditary calculation. Outcomes of the manipulative illustration confirm the confinement adequacy and accuracy of the anticipated strategy is perfect and attractive and that exactness of limitation is enhanced contrasted with some other restriction improvement system. Hajipour et al. broke down ideal two winding circulation transformer estimating in a symphonious included load condition by unique programming method. The contorted consonant streams created in these new situations conditions not just essentially increment the transformer press and center misfortunes, additionally cause strange center winding temperature rise and thus transformer exorbitant death toll investigation. In this way the consonant substance of the short circuits streams ought to be accounted in picking the appropriate size of two winding conveyance transformers. To address this uneasiness of utilities, this paper acquaints another technique with take care of the OTS issue in such conditions. Fei et al. portrayed blame finding of energy transformer in light of bolster vector machine with the assistance of hereditary calculation improvement strategy. The determination of bolster vector machine (SVM) parameters has a critical impact on the given exactness of SVM. In this review, bolster vector machine with hybrid and change based hereditary calculation is connected to figure the blame examination of a two winding force transformer and the exploratory information from a few electric power organizations in China are utilized to show the execution of the proposed framework demonstrate. Balaga et al. created hereditary calculation based parallel shrouded layered simulated neural system (ANN) based differential security of three stage two winding force transformer. The anticipated strategy has been acknowledge through various ANN structures including another modified parallel-shrouded layered outline, which begin to be more exact in separating between the typical wave and defective bended wave regardless of the shape likeness. A blend of two ANNs in Master–Slave mode has additionally been talked about further Back Propagation (BP) and Genetic Algorithm (GA) are utilized to instruct the multi-layered encourage forward neural system and their reenacted results are thought about their performance Table 2. Table 2. Summary of optimization technique used in transformer. Illias et al. utilized hybrid particle swarm optimization advancement time fluctuating quickening coefficient-manufactured neural system for power transformer blame determination investigation. In this work, half and half altered transformative molecule swarm advancement time shifting speeding up coefficient (MEPSO-TVAC) - simulated neural system (ANN) was proposed for transformer blame finding in light of disintegrated gas information. This is because of these two techniques having never been anticipated for two winding transformer blame analysis before. Thilagar et al. examined parameter estimation of threewinding transformers utilizing the idea of hereditary calculation enhancement method. The proposed method likewise assesses geometrically a multifaceted parameter that is spillage flux amongst auxiliary and tertiary windings, which would be helpful in transient and enduring state investigation. Close to the immersion impact of the two winding transformer is considered by gauge a to a great degree nonlinear execution parameter that is charging circuit reactance. Diverse investigate based streamlining instruments are viable for parameter estimation among which the outcomes acquired utilizing hereditary calculation enhancement method is observed to energize. Galdi et al. portrayed execution parameter recognizable proof of two winding force transformers proportionate model by hereditary calculations enhancement system ideas. The anticipated technique depends on a hybrid and transformation based hereditary calculation (GA) which dealing with the short out current and on the deliberate problem area temperature design, grants to distinguish an exact arrangement of execution parameters for the warm proportionate model of the two winding force transformer. Shintemiroy et al. examined enhanced displaying of two winding force transformer winding utilizing bacterial swarming calculation (BSA) and recurrence reaction investigation. With the motivation to exactly perceive transformer windings execution parameters a model-based acknowledgment advance toward is presented utilizing a notable lumped parameter demonstrate. It incorporates look space estimation utilizing scientific figuring’s, which is utilized for the resulting model parameters recognizable proof with a novel BSA. Kucuk et al. portrayed expectation of energy misfortunes in transformer centers utilizing encourage forward neural system and hereditary calculation. The enhanced numerical proportional model was connected to the next delicate and hard attractive materials and streamlines its execution parameters with the point of neural systems. Darabad et al. investigated a productive PD information digging strategy for two winding force transformer deformity models utilizing SOM procedure. One of the requesting issues in this glade is the kind of legitimate components fit for separating the inclusion of conceivable sorts of PD sources. With a specific end goal to analyze the effectiveness of the technique built up in this paper, which depends on use of an arrangement of new element spaces, surface element investigation. Adly et al. depicted an execution arranged two winding force transformer outline philosophy utilizing multi-objective developmental improvement strategy. In this paper a power transformer outline philosophy utilizing multi-objective developmental advancement is proposed. Utilizing this strategy which is custom-made to be target execution circuit configuration situated brisk harsh estimation of single stage transformer outline specifics might be construed. Souahila et al. broke down multi-level neural system based choice for power transformers blame conclusion utilizing an enhanced blend of Rogers and Doernenburg proportions DGA. The paper shows a near review on one hand for the decision the most fitting DGA technique and to determine the issue of contention between the Rogers and Doernenburg proportions strategies. Then again, it thinks about the different MLP structures by contrasting two yield information sorts and three concealed layer sorts with the mean to set up the most fitting MLP demonstrate. Before testing, the proposed structures are prepared and tried by the exploratory information from Tunisian Company of Electricity and Gas (STEG). Rahimpour et al. surveyed by applying manufactured streamlining strategies for transformer display diminishment of lumped parameter models. Models with couple of components are by and large more practicable for power framework thinks about yet to the detriment of exactness. The utilization of fake techniques to diminish a R-C-L-M model is the principle commitment of this paper. Favorable circumstances of the recommended strategy include: (1) a decreased loss of precision contrasted and the first model and (2) the adaptability to pick the quantity of model components to accomplish the coveted model contingent upon size and exactness. The capacity of three diverse manufactured techniques, hereditary calculation, molecule swarm improvement, and bacterial rummaging calculation, to model diminishment is assessed utilizing estimations on a genuine 400 kV test question and the outcomes are contrasted and those gotten by regular explanatory formulae. Liao et al. talked about molecule swarm enhancement slightest squares bolster vector relapse construct anticipating model in light of broke up gasses in oil-filled power transformers. This paper displays an estimating model in view of minimum squares bolster vector machine (LS-SVM) relapse and molecule swarm enhancement (PSO) calculation on disintegrated gasses in oil-filled power transformers. In the first place, the LS-SVM relapse demonstrate, with outspread premise work (RBF) piece, is set up to encourage the guaging model. At that point a worldwide enhancer, PSO is utilized to upgrade the hyper-parameters required in LS-SVM relapse. A short time later, a methodology is advanced to fill in as a compelling device for anticipating of gas substance in transformer oil. Han et al. assessed Transformer Fault Diagnosis with the assistance of Feature Selection and Parameter Optimization. The right determination of elements of broke down gas information can enhance proficiency of transformer blame analysis. SVM is more viable than customary mathematic model to describe the kind of blame of transformer. As for the issue of trouble of deciding parameters in SVM applications, hereditary calculation (GA) was utilized to choose SVM parameters. The test outcomes demonstrate that this GA-SVM model is successful to recognize disappointment of transformer. Yu et al. investigated oil-drenched power transformer inner blame finding research in view of probabilistic neural system. In this paper by utilizing probabilistic neural system calculation, which brings its capacity of preparing non-direct issue into full play. Also, the DGA judgment process is streamlined and advantageous setting of parameters is accomplished. The high precision of analysis is affirmed by reenactment brings about KNIME stage. Lin et al. examined dim grouping investigation for early blame determination in oil-inundated transformers. This paper proposes a strategy for nascent blame determination in oil-submerged transformers utilizing dim bunching examination (GCA). Beginning issues can create hydrocarbon particles and carbon oxides because of the warm deterioration of oil, cellulose, and other strong protection. The power transformers can be recognized and screen irregular conditions with disintegrated gas examination (DGA). Different simulated savvy (AI) procedures have been proposed for transformer blame finding; notwithstanding they have a few confinements, for example, precision of conclusion, prerequisite of induction standards, and assurance of the discovery design. Fei et al. portrayed molecule swarm advancement based bolster vector machine for estimating broke up gasses content in power transformer oil. The technique has solid worldwide pursuit capacity, as well as is anything but difficult to execute. In this way, the proposed PSO–SVM model is connected to gauge disintegrated gasses content in power transformer oil in this paper, among which PSO is utilized to decide free parameters of bolster vector machine. Outcomes: Number of author already utilized different optimization technique for minimization and maximization function of different essential parameter of transformer. In future number of optimization techniques provides better results compare to traditional optimization technique, such as cookoo optimization technique and fish fly optimization technique provide good solution of given equation and constraints parameter of transformer. Critical path method and PERT technique provide distance minimization solution between transmission and distribution system. The Rale programming gives you the chance to mimic the composed transformer under differing conditions and watch how the transformer will respond under those conditions. You will get data precisely as though you had constructed a model and made real estimations in your own particular research center. In this way, until you have an outline emphasis that meets the greater part of your prerequisites you don't have to manufacture any test transformers. In view of the product outline and the simplicity of making various emphases of a similar plan, it is anything but difficult to upgrade the transformer configuration to utilize at least costly materials. You can alter the plan to meet you possess stock needs utilizing wire sizes and steel reviews that cost less for you to buy and are best for simple generation. The Opera simulation suite uses the finite element method to simulate the electrical, thermal and structural behavior of single and three phase transformer. A virtual prototyping tool that can be used to explore design variants, optimize and refine designs, Opera offers test results that can be as accurate as physical testing. 2d and 3d device evaluation using advanced Finite Element simulation, full non-linear and locally orthotropic material representations for both electromagnetic and thermal behavior of transformer also described in this software. Dadmatrac Electronics has developed Windows-based software for designing small transformers working in line-frequency (50/60 Hz) and High frequency (10 to 500 KHz) for use in SMPS. Line frequency transformers are divided in to two categories, i.e. ordinary transformers for use in linear power supplies, inverters; and auto transformers for voltage control, up to a capacity of 5000 W using CRGO/CRNO (E-II) laminations. Prolific software's versatility provides for multiple, user defined permutations and combinations based on the type of a transformer, type of phase, type of winding, type of cooling, various rated capacities, various vector connections, and tap changers. Prolific software has features for different types of inspections such as final, internal, after-short-circuit, before-short-circuit, and customer witness inspection. Prolific software has in-built Instrument drivers that are compatible with almost all makes and models of test 0instruments in vogue. The availability of most of the instrument drivers makes the application independent of the instrument being used for the test measurement. This work can be considered as different aspects of transformer which is widely used in electrical power system. Potential effort includes the study of the use of special design and amorphous material based transformers and the investigation in different power filters for harmonics canceling and reactive power compensation. It is also necessary to develop high level energy efficient transformer which is energy consumption is very less. Taci MS, et al. The Effect of the harmonic components upon transformer active losses in case of (non) sinusoidal sources and (non) linear loads. International Conference on Industrial Technology. 2000. Sadati SB, et al. Comparison of distribution transformer losses and capacity under linear and harmonic loads. Power and Energy Conference 2008; 1265-1269. FM William.Hand book of transformer design and application, second edition, United States of America. 1992.
kulkarni SV, et al. transformer engineering design and practice. 2004;1-496. Ramos A, et al.Influence of tertiary stabilizing windings on zero-sequence performance of three-phase three-legged YNynd transformers. Part I: Equivalent circuit models. Electric Power Systems Research. 2017;144:32-40. Ramos A, et al. Influence of tertiary stabilizing windings on zero-sequence performance of three-phase three-legged YNynd transformers. Part II: Tank overheating hazard and short-circuit duty. Electric Power Systems Research. 2017;145:149-156. Xiaoxiao D, et al. A new equivalent circuit for piezoelectric with three losses and external loads. Sensors and Actuators A: Physical. 2017;256:77-83. Krupa SH, et al. Assessing mechanical deformations in two-winding transformer unit using reduced-order circuit model. International Journal of Electrical Power and Energy Systems. 2016; 79:235-244. Juan MVA, Equivalent circuit of transformers with control of voltage and phase angle. Electric Power Systems Research. 2011;81:1349-1356. Mombello EE, et al. A novel linear equivalent circuit of a transformer winding considering the frequency-dependence of the impedances. Electric Power Systems Research. 2007;77:885-895. Zhang Y, et al. Three-port equivalent circuit of multi-layer piezoelectric stack. Sensors and Actuators A: Physical. 2015;236:92-97. Alberto CD, et al. Effect of a lossy dispersive ground on lightning overvoltage’s transferred to the low-voltage side of a single-phase distribution transformer. Electric Power Systems Research. 2017. Juan RC, et al. Evaluation of distribution transformer banks in electric power system. International Transaction on Electrical Energy System. 2013;23:364-379. Bihan YL. Study on the transformer equivalent circuit of eddy current nondestructive evaluation, NDT and E International. 2003;36:297-302. Boukazouha F, et al. Piezoelectric transformer: Comparison between a model and an analytical verification. Computers and Structures. 2008;86:374-378. Milano F, et al. Dynamic REI equivalents for short circuit and transient stability analyses. Electric Power Systems Research. 2009;79:878-887. Cui Y, et al. Pattern recognition techniques for power transformer insulation diagnosis—a comparative study part 1: framework, literature, and illustration. International Transactions on Electrical Energy Systems. 2015;25:2247-2259. Hemsel T, et al. Model based analysis of piezoelectric transformers. Ultrasonics 2006;44:741-745. Olivier G, et al. Analytical model of a T-connected three-phase transformer. Mathematics and Computers in Simulation. 2003;63:407-419. Rao KSR, et al. Optimal design of a furnace transformer by intelligent evolutionary methods. International Journal of Electrical Power and Energy Systems. 2012;43:1056-1062. Tsili MA, et al.Computer aided analysis and design of power transformers. Computers in Industry. 2008;59:338-350. Kelly D, Equivalent circuit parameters for power frequency transformers. Electric Power Systems Research. 1987;12:131-136. Liu X, et al. Numerical research on the losses characteristic and hot-spot temperature of laminated core joints in transformer. Applied Thermal Engineering 2017;110:49-61. Ramamurthy JR, et al. Influence of voltage harmonics on transformer no-load loss measurements and calculation of magnetization curves. Electric Power Systems Research 2017;146:43-50. Picanco AF, et al. Voltage distribution constant versus losses in medium-voltage distribution transformer: A polynomial interpolation approach. International Journal of Electrical Power and Energy Systems 2016;80:64-72. Villén MT, et al. Procedure to accelerate calculations of additional losses in transformer foil windings. Electric Power Systems Research 2013;95:85-89. Pronto AG, et al. A Possible Solution to Reduce Magnetic Losses in Transformer Cores Working at Liquid Nitrogen Temperature. Physics Procedia 2012;36:1103-1108. Janu Z, et al. Experimental setup for precise measurement of losses in high-temperature superconducting transformer. Cryogenics 2006;46:759-761. Susnjic L, et al. 3D finite-element determination of stray losses in power transformer, Electric Power Systems Research 2008;78:1814-1818. Pan C, et al. Analysis Based on Improved Method for Transformer Harmonic Losses. Energy Procedia 2012;16:1845-1851. Georgilakis PS, et al. Prediction of iron losses of wound core distribution transformers based on artificial neural networks. Neurocomputing 1998;23:15-29. Raitsios P, et al. Transformers of reduced losses and evaluation of their repair. Journal of Materials Processing Technology 2005;161:204-209. Zhi Zhang Z, et al. A novelty digital algorithm for online measurement of dielectric loss factor of electronic transformers. Measurement 2013;46:1200-1207. Yazdani-Asrami M, et al. No-load loss calculation of distribution transformers supplied by nonsinusoidal voltage using three dimensional finite element analysis. Energy 2013;50:205-219. Azil IH, et al. Hybrid modified evolutionary particle swarm optimisation-time varying acceleration coefficient-artificial neural network for power transformer fault diagnosis. Measurement 2016;90:94-102. Kucuk I, et al. Prediction of power losses in transformer cores using feed forward neural network and genetic algorithm. Measurement 2006;39:605-611. Arri E, et al. Uncertainty analysis in a novel method for transformer power losses measurement. Measurement 1994;12:315-320. Gouda OE, et al. Predicting transformer temperature rise and loss of life in the presence of harmonic load currents. Ain Shams Engineering Journal 2012;3:113-121. Escarela-Perez R, et al. Multi-port network and 3D finite-element models for accurate transformer calculations: Single-phase load-loss test. Electric Power Systems Research 2008;78:1941-1945. Cortez SF, et al. A cognitive system for fault prognosis in power transformers. Electric Power Systems Research 2015;127:109-117. Samimi MH, et al. Detection of transformer mechanical deformations by comparing different FRA connections. Power and Energy Systems 2017;86:53-60. Dolce S, et al. Test instrument for the automatic compliance check of cast resin insulated windings for power transformers. Measurement 2017;100:50-61. Bengang W, et al. Studied on simulation test device of transformer split type cooling system. Energy Procedia 2016;100:556-560. Guerra G, et al. A solid state transformer model for power flow calculations, International Journal of Electrical Power & Energy Systems 2017;89:40-51. Sahebi A, et al. Power transformer inrush currents and internal faults discrimination methods in presence of fault current limiter. Renewable and Sustainable Energy Reviews 2017;68:102-112. Li Y, et al. Modular multilevel converter type solid state transformer with internal model control procedure. International Journal of Electrical Power and Energy Systems 2017;85:153-163. Arumugam SK. On terminal connection and system function pair during SFRA testing on three phase transformers. International Journal of Electrical Power and Energy Systems 2014;58:101-110. Alepuz S, et al.Testing of a bidirectional distribution electronic power transformer model. Electric Power Systems Research 2014;107:230-239. Purwadi A, et al. Testing and diagnostics of neutral earthing current on 500kv/150kv inter bus transformer in tasikmalaya EHV main substation. Procedia Technology 2013;11: 980-988. Jin M, et al. Vibration transmission from internal structures to the tank of an oil-filled two winding power transformer. Applied Acoustics 2016;113:1-6. Borowik L, et al. Eco-efficient control of the cooling systems for power transformers. Journal of Cleaner Production 2016;139:1551-1562. Zhou H, et al. Two winding transformer winding fault detection by vibration analysis methods. Applied Acoustics 2016;114:136-146. Rostaminia R, et al. Transformer core contribution to partial discharge electromagnetic waves propagation. International Journal of Electrical Power and Energy Systems 2016;83:40-48. Yang Q, et al. Measurement and analysis of transient overvoltage distribution in transformer windings based on reduced-scale model. Electric Power Systems Research 2016;140:70-77. Ali AA, et al. Precise scheme for detection of current transformer saturation based on time frequency analysis. Measurement 2016;94:692-706. Jung JK, et al. Current transformer burden in a current transformer testing system using a shunt resistor. Measurement 2007;40:876-882. Khanali M, et al. Reliability analysis of transformer internal faults using sweep frequency response analysis. Electric Power Systems Research 2017;145:55-62. Hamzeh M, et al.Reliability analysis of distribution transformers with high penetration of distributed generation. International Journal of Electrical Power and Energy Systems 2015;73:163-169. Ma J, et al. Load transfer strategy based on power transfer capability for main-transformer fault. International Transactions on Electrical Energy Systems 2015;25:3439-3448. Guerra G, et al. Reliability assessment of a solid state transformer model for power flow calculations. International Journal of Electrical Power and Energy Systems 2017;89:40-51. Kaczmarek M.voltage to single-ended voltage converter to determine the composite error of voltage transformers and dividers for transformation of sinusoidal and distorted voltages. Measurement 2017;101:53-61. Hajipour E, et al. Probability assessment of distribution transformer sizing in a harmonic involved load environment via dynamic programming technique. Energy 2017;120:92-105. Zhang LL, et al. Statistical analysis of inrush currents in power transformers based on higher-order statistics. Electric Power Systems Research 2017;146:161-169. Ahmad A, et al. Short circuit stress analysis using FEM in power transformer on HV winding displaced vertically and horizontally. Alexandria Engineering Journal 2016. Suwanasri T, et al. Risk-based maintenance for asset management of power transformer: practical experience in Thailand. International Transactions on Electrical Energy Systems 2014;24:1103-1119. Sefidgaran M, et al. Reliability model of the power transformer with ONAF cooling. International Journal of Electrical Power and Energy Systems 2012;35:97-104. Hong K, et al. A vibration measurement system for health monitoring of power transformers. Measurement 2016;93:135-147. Zhang YY, et al. Forecasting of Dissolved Gases in Oil-immersed Transformers Based upon Wavelet LS-SVM Regression and PSO with Mutation. Energy Procedia 2016;104:38-43. Murugan R, et al. Failure analysis of power transformer for effective maintenance planning in electric utilities. Engineering Failure Analysis 2015;55:182-192. Abdelfatah M, et al. Reliability analysis of 220 kV power transformers in Egypt. Ain Shams Engineering Journal 2011;2:183-194. Godina R, et al. Innovative impact assessment of electric vehicles charging loads on distribution transformers using real data in terms of reliability assessment. Energy Conversion and Management 2016;120:206-216. Chojnacki LA. New reliability coefficients of MV/LV transformer/distribution substation and its components. International Journal of Electrical Power and Energy Systems. 2012;43:992-995. Madavan R, et al. Failure analysis of transformer liquid solid insulation system under selective environmental conditions using Weibull statistics method. Engineering Failure Analysis 2016;65:26-38. Jirutitijaroen P, et al. The effect of transformer maintenance parameters on reliability and cost analysis by probabilistic model. Electric Power Systems Research 2004;72:213-224. Martins MA. Condition and risk assessment of power transformers which is a general approach to calculate a Health Index of two winding transformer. Ciência and Tecnologia dos Materiais 2014;26:9-16. Esmaeeli M, et al. Multistage distribution substations planning considering reliability and growth of energy demand. Energy 2015;84:357-364. Testa A, et al. Described probabilistic approach to size step-up transformers for grid connected PV plants. Renewable Energy 2012;48:42-51. Han H, et al. Probability assessment by transformer fault diagnosis based on feature selection and parameter optimization. Energy Procedia 2011;12:662-668. Abu-Elanien EB, et al. Probability and reliability assessment by asset management techniques for two winding transformers. Electric Power Systems Research 2010;80:456-464. Kaczmarek M. A practical approach to evaluation of accuracy of inductive current transformer for transformation of distorted current with higher harmonics. Electric Power Systems Research 2015;119:258-265. Hajipour E, et al. Sizing of optimal distribution transformer in a harmonic involved load environment and optimized by dynamic programming technique. Energy 2017;120:92-105. Noshad B, et al. A new model to study ultra-saturation phenomenon during the energization of a loaded three-phase power transformer and its effects on differential protection. International Transactions on Electrical Energy Systems 2015;25:3681-3703. Kaczmarek M.Differential voltage to single-ended voltage converter to determine the composite error of voltage transformers and dividers for transformation of sinusoidal and distorted voltages. Measurement 2017;101:53-61. Taheri S, et al. Modeling and simulation of two winding transformer loading capability and hot spot temperature under harmonic conditions. Electric Power Systems Research 2012;86:68-75. Mazin EH, et al. Harmonic cancellation characteristics of specially connected transformers. Electric Power Systems Research 2009;79:1689-1697. Sarimuthu RC, et al. A review on voltage control methods using on-load tap changer transformers for networks with renewable energy sources. Renewable and Sustainable Energy Reviews 2016;62:1154-1161. Muruganantham B, et al. Challenges with renewable energy sources and storage in practical distribution systems. Renewable and Sustainable Energy Reviews 2017;73:125-134. Bakhsh IF, et al. Developed new synchronous generator based wind energy conversion system which is used for feeding an isolated load through variable frequency transformer. Renewable Energy 2016;86:106-116. Bakhsh IF, et al. Application of variable frequency transformer (VFT) for grid interconnection of PMSG based wind energy generation system. Sustainable Energy Technologies and Assessments 2014;8:172-180. Manito A, et al. Evaluation of utility transformers' lifespan with different levels of grid-connected photovoltaic systems penetration. Renewable Energy 2016;96:700-714. Gadelrab RG, et al. Wind farms-fed HVDC system power profile enhancement using solid state transformer based flywheel energy storage system. Journal of Energy Storage 2015;4:145-155. Pinto SF, et al. Modular matrix converter based solid state transformer for smart grids. Electric Power Systems Research 2016;136:189-200. Hu J, et al. Coordinated voltage control of a decoupled three-phase on-load tap changer transformer and photovoltaic inverters for managing unbalanced networks. Electric Power Systems Research 2016;131:264-274. Chakraborty S, et al. Transformer-less single-phase grid-tie photovoltaic inverter topologies for residential application with various filter circuits. Renewable and Sustainable Energy Reviews 2016. Liu HL. Acoustic partial discharge localization methodology in power transformers by employing the quantum genetic algorithm. Applied Acoustics 2016;102:71-78. Hajipour E, et al. Optimal two winding distribution transformer sizing in a harmonic involved load environment by dynamic programming technique. Energy 2017;120:92-105. Fei SW, et al.Fault diagnosis of power transformer based on support vector machine with the help of genetic algorithm. 2009;36:11352-11357. Balaga H, et al. GA trained parallel hidden layered ANN based differential protection of three phase power transformer. International Journal of Electrical Power and Energy Systems 2015;67:286-297. Illias AH, et al. Hybrid modified evolutionary particle swarm optimization-time varying acceleration coefficient-artificial neural network for power transformer fault diagnosis. Analysis Measurement 2016;90:94-102. Thilagar SH, et al. Parameter estimation of three-winding transformers using the concept of genetic algorithm optimization technique. Engineering Applications of Artificial Intelligence 2002;15:429-437. Galdi V, et al. Parameter identification of power transformers thermal model by genetic algorithms concepts. Electric Power Systems Research 2001;60:107-113. Shintemirov A. Improved modelling of power transformer winding using bacterial swarming algorithm and frequency response analysis. Electric Power Systems Research 2010;80:1111-1120. Kucuk I, et al. Prediction of power losses in transformer cores using feed forward neural network and genetic algorithm. Measurement 2006:39:605-611. Darabad VP, et al. An efficient PD data mining method for power transformer defect models using SOM technique. International Journal of Electrical Power and Energy Systems 2015;71:373-382. Adly AA, et al. A performance-oriented power transformer design methodology using multi-objective evolutionary optimization. Journal of Advanced Research 2015;6:417-423. Souahlia S, et al. MLP neural network-based decision for power transformers fault diagnosis using an improved combination of Rogers and Doernenburg ratios DGA. International Journal of Electrical Power and Energy Systems 2012;43:1346-1353. Rahimpour E, et al.Applying artificial optimization methods for transformer model reduction of lumped parameter models.Electric Power Systems Research 2012;84:100-108. Liao R, et al. Particle swarm optimization-least squares support vector regression based forecasting model on dissolved gases in oil-filled power transformers. Electric Power Systems Research 2011;81:2074-2080. Han H, et al. Transformer Fault Diagnosis with the help of Feature Selection and Parameter Optimization. Energy Procedia 2011;12:662-668. Yu S, et al. Oil-immersed power transformer internal fault diagnosis research based on probabilistic neural network. Procedia Computer Science 2016;83:1327-1331. Lin CH, et al. Grey clustering analysis for incipient fault diagnosis in oil-immersed transformers. Expert Systems with Applications 2009;36:1371-1379. Fei SW, et al. Particle swarm optimization-based support vector machine for forecasting dissolved gases content in power transformer oil. Energy Conversion and Management 2009;50:1604-1609. Mainali K, et al. Design, measurement and equivalent circuit synthesis of high power HF transformer for three-phase composite dual active bridge topology.IEEE Applied Power Electronics Conference and Exposition - APEC 2014: 342-349. Dong S, et al. Equivalent circuit and optimum design of a multilayer laminated piezoelectric transformer. IEEE Transactions on Ultrasonic, Ferroelectrics, and Frequency Control 2011;58:2504-2515. Sibue RJ, et al. Modeling of large air gap transformers using magnetic equivalent circuit for designing of high power application. Biennial IEEE Conference on Electromagnetic Field Computation 2010;1-8. Lord H, Analog equivalent circuit aided design of ferroresonant transformers and circuits. IEEE Transactions on Magnetics 1977;13:1293-1298. Cao L, et al. Linear Circuit Model of the Three-phase Insulated Core Transformer Power Supply. IEEE Transactions on Nuclear Science 2016;63:288-296. Crispino M, et al. An optimization technique for transformermagnetic and thermaldesign.International Symposium on Power Electronics, Electrical Drives, Automation and Motion (SPEEDAM) 2016;435-441. Phaengkieo D, et al. Design optimization of electrical transformer using artificial intelligence techniques. 18th International Conference on Electrical Machines and Systems (ICEMS) 2015;1381-1385. Da Silva AML, et al. Spare transformers optimization using Monte Carlo simulation and metaheuristic techniques. International Conference on Intelligent System Application to Power Systems (ISAP) 2015;1-6. Amoiralis IE, et al. A Parallel Mixed Integer Programming-Finite Element Method Technique for Global Design Optimization of Power Transformers. IEEE Transactions on Magnetics 2008;44:1022-1025. Mustafar FM, et al. Ant Colony Optimization (ACO) Based Technique for Voltage Control and Loss Minimization Using Transformer Tap Setting. Conference on Research and Development 2007;1-6. Singh A, et al. Dissolved Gas Analysis of power transformer using K-means and Support Vector Machine. IEEE International Conference on Power Electronics, Intelligent Control and Energy Systems (ICPEICES) 2016;1-5.